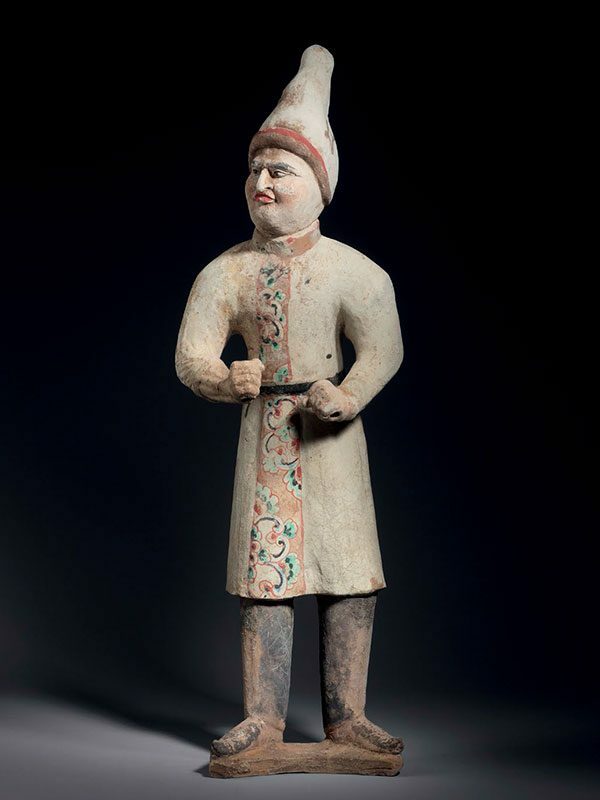 A large pottery model of a male groom of foreign appearance, standing tall and slightly turning his head towards the right. He raises both his arms up in front of his body with the elbows bent, and his hands are clenched strongly in fists, as if grasping something. The figure is dressed in long-sleeved, three-quarter length layered robes. The outer robe, which loosely drapes above the top of his flat pointed black boots, is tied with a black belt. Exceptionally, the white outer robe is adorned with a well-preserved vertical band painted in red, green and black pigments with scroll patterns. The same decoration is partially visible around his collar. On his head he wears a pointed, red-rimmed cap adorned with two diamond-shaped patterns on either side. His arched eyebrows, bulging eyes, large prominent nose and fleshy lips define his animated facial expression and the face retains extensive remains of the original pigments.